The clocks have gone back, so winter is officially here. It’s time to get ready for that chill factor. Right now Debenhams have a 25% off sale on a huge range of coats and boots for men, women and children. 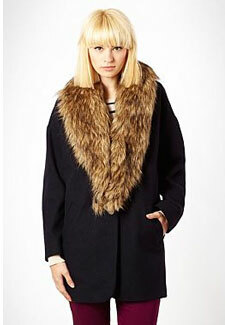 We’re loving this Red Herring navy faux fur coat, which comes with a detachable collar to keep you cosy and stylish. It’s currently down from £79 to £59.25 and standard delivery is free because it’s over £30! As for boots, you’ll find money off a wide selection from knee length to ankle boots and wedges. Our favorites include black high wedge lace up boots by Henry Holland, only £22.50, and mid-high boots with buckle detailing which have been slashed twice in price! Originally £25, they’re yours for only £15.